A luxurious, natural red ruby attracts you to this estate ruby diamond platinum engagement or dinner ring. 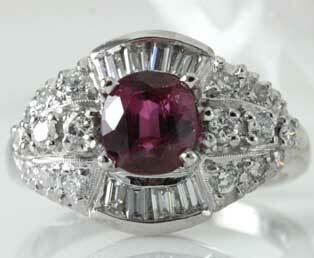 Centered is a 1 1/4 carat weight violet-red ruby, that will warm her heart. The red color tones of this centered cushion-cut ruby is complimented by a field of high quality white diamonds (0.64, VS1, VS2, F - H), all mounted in rich, white platinum. Whether worn as a wedding ring or a cocktail ring, this luxurious ruby ring will always be cherished. This 1930s Art Deco ruby diamond platinum engagement ring is in excellent condition. The color red has more personal associations than any other color. Recognized as a stimulant red is inherently exciting and the amount of red is directly related to the level of energy perceived in a person. Red draws attention and the use of red as an accent can immediately focus attention on a particular element.